Walking into the Murray Theater last weekend, I couldn't help but let the edges of my mouth curl into a grin. One thing I have got to give Johnny Hebda's Utah Repertory Theater Company is that they always do their darndest to create atmosphere for their patrons. In What the Bellhop Saw, you will find your tickets at a hotel check-in desk in the hands of the hotel staff, after which the bellhops usher you to your seats. Who doesn't love feeling a part of the show and removed from the real world before the show even begins? My impressions were further reinforced as I gazed up on the stage in wonderment at the set. I've been to the Murray theater many times and never expected to see a 1940's art deco hotel room constructed on the stage. 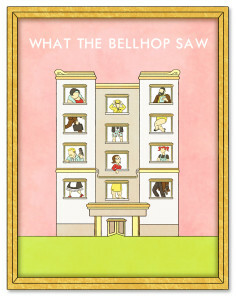 What the Bellhop Saw, is a farcical comedy set in a New York City hotel. The actual era of the show was a little lost on me as I know it was written in 1989, however music from the 1940s through today played throughout the show and the characters dressed in 1940s-style clothing. As far as the storyline, you've got a man trying to seduce is secretary, a scheming brother, a terrorist, a manly jealous wife, and a sleep-your-way-to-the-top maid. That's really all you need to know. I don't want to get too into the plot, as that's not what creates the fun about this show. You've got cheesy, "Naked Gun"-esque lines, like a pantsless man stating, "You scared the pants off me," visual farce such *spoiler alert* a man dressed as a woman, and staging that constantly has your eyes darting from one side of the stage to the other as the actors run in and out of the room in dizzying array. Kudos to director Chasey Ramsey! Arlene, the jealous wife played by Jake Suazo, is physically hilarious and daunting, yet he often seemed on the verge of a smile. When you see the show you can tell why he'd want to bust up laughing at any moment, alas the cruelty of the character isn't as sharp as it could be if you think the character may chuckle. Thank heavens the only things truly busting up were the buttons off the bosom area of his dress. Wardrobe malfunction or intentional, I covered my mouth to keep myself from giggling too loud every time I noticed. The only tidbits that rubbed me the wrong way were a few lines I like to call "throw away lines." These are strange transitional lines that seem to make no sense in the course of the show, yet the writers throw them in anyway. I thought most of these were cleverly hidden, but a couple fell flat and stalled the pace of the show. Expect lots of yelling (hallelujah the actors are not miked so the yelling is awesome instead of shrilly busting out eardrums), lots of running, slamming doors, and fast-paced action. I cannot tell you how impressed I was with this troupe rarely missing a beat of the frantic comedy pacing. The first half of the show is about 45 minutes, while the second half less than thirty. This is refreshing after too many a 2.5 hour show. I appreciate a group wanting to do a show simply because it is fun...it's refreshing. I don't think enough people celebrate zaniness for the sake of zaniness. Sometimes we need a show that reminds us that acting is fun and life is silly, pure and simple. Not enough theaters in Utah attempt to embrace the fluff of comedies of the physical, mad-cap comedies of old. One of the actors in the talk back session after the show stated, "This show is nonsense and it celebrates that." Director Ramsey stated my summary of the show best in his production notes, "...It will not change your life, and it won't even make you think. We do this to allow you to escape, laugh, and simply find freedom from stresses and blemishes in your lives." You will enjoy each cast member in this strong ensemble: Jack Kyle Oram as Wally, James McKinney as Georgie, Daniel Whiting as Mr. Bickhardt, Benjamin James Henderson as Stan, Jason Sullivan as Roger, Bethany R. Woodruff as Missy, Maddy Belle Forsyth as Heather, M. Chase Grant as Guest, Jake Ben Suazo as Arlene, Robbie X Peirce as Babu, and Aubrey Bench as Little Heidi. The pro-team is: Brian Grob the Assistant Director, Emily Griffith the Stage Manager, Kevin Dudley the Set Designer, Allen Stout the Costume Designer, Caitlin Mattie Webb the Makeup Designer, and Ariel Mitchell the Dramaturg. If you'd like to check into the What the Bellhop Saw hotel at the Murray Theater on 4691 State Street for an evening away from the world, you've got three chances left - Friday June 14th at 7:30pm, Saturday June 15th at 2pm, and Saturday June 15th at 7:30pm. Get tickets here.